Inky's escape exploits were legendary at the aquarium where he resides. During his days in the deep sea, he was already a deep-sea escape artist extraordinaire. He'd slithered his way out of every trap ever invented and lived to tell the tale. And Inky is quite the raconteur, telling his escape stores with perhaps a soupcon of exaggeration. Taking a luxury respite at the local aquarium, Inky regales his tank mate Blotchy during their nightly card games with his stories of daring getaways. So one night, Blotchy challenges Inky to put his money where his mouth is. "I bet you can't escape from HERE!" Inky takes Blotchy's bet, and eventually one of the keepers slips up and leaves the lid a little bit ajar on their tank. Inky takes advantage of the opening. He lifts the lid, squeezes through the opening, and works his way out and down onto the floor of the exhibit hall. He offers Blotchy a chance to go with him, but Blotchy declines. "Tomorrow's Fondue Friday. I don't want to miss that." "I'm going to make cephalopod history!" Inky brags. Inky oozes across the floor, leaving a slightly slippery trail behind him until he finds a drain in the tile floor which finally empties into--the ocean. It's back home again in Oceania for Inky, where he goes where he will and sleeps in the deep. But... sometimes he gets lonesome for his old pal Blotchy and sneaks back into the aquarium for a card game and a chance to tell some stories of his Greatest Ingenious Escape! 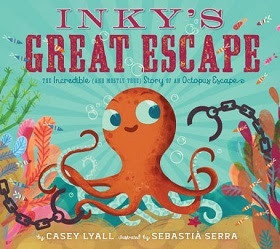 It is indeed true that captive octopi are indeed ingenuous escape artists, as their aquatic keepers will tell us, and Casey Lyall's Inky's Great Escape: The Incredible (and Mostly True) Story of an Octopus Escape has some fun embellishing the true story of the octopus who indeed escaped from the New Zealand Aquarium, and artist Sebastia Serra's illustrations conspire by providing classic comic strip-style characters for this semi-true but not so serious story. As Kirkus Reviews puts it, "a joyful but misleading re-creation of a fabulous feat." For a less "misleading" version of this amazing but true story, read my review of another lively re-telling, Inky the Octopus: Bound for Glory, here. "Tell me, Carter. How did you survive being lost in the rainforest?" the reporter asked. Did you talk with Anna?" I asked. "I'll be meeting with her tomorrow." he said. "I want your version of what happened in Costa Rica for the Survivor Diaries I'm writing. About kids like you making it out of life-threatening situations." Carter doesn't want to tell the reporter how scared he was. He has always been fearful and even subject to panic attacks. But he had no inkling how truly frightening his walk down a well-trodden visitor's trail with Anna was going to be. Carter was traveling with his parents, staying in a resort community in the rainforest, and his dad thought he should find someone his age to hang out with. But Anna was taller, a year older, and a lot bolder, and Carter was determined not to give her any chance to call him a baby. So when she suggested following a path off the trail to see the waterfall and statue of the monkey-witch, he hesitated. I peered into the branches and imagined all the horrible things that could go wrong. I was shaking my head to refuse, when I saw it--the resplendent quetzal bird. That's the rare bird Carter had hoped would be number 308 in his birder list, and he agrees to follow Anna down the path as the bird flies that way. The foliage gets thicker and darker, but the two reach the statue, which Anna shames him into the traditional licking for good luck. That's when I noticed how dark it was getting. Anna seemed to notice at the same time. "We should head back." she said. Just as we turned we heard a terrifying noise. It sounded like a lion's roar or a grizzly about to charge. Suddenly the canopy of foliage above them exploded in dreadful howls and dark hairy bodies. It's a troop of howler monkeys and even Anna screams and dashes into the bush and Carter has to follow. And soon Carter's worst fears become true. They discover that they are hopelessly lost in the jungle. At first Carter staves off panic as he pulls out the emergency kit he always keeps with him, but one of the marauding monkeys scampers down and seizes it, leaving nothing but a plastic bag behind. The two are really lost and realize that they are going to have to save themselves with a plastic bag and what they've got in their heads. 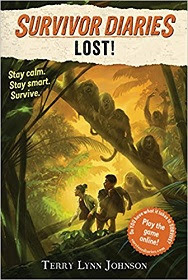 Luckily, Carter is a factoid freak, a collector of random information, in Terry Lynn Johnson's third book in the Survivor's Diary series, Lost! (Survivor Diaries) (Houghton Mifflin Harcourt, 2018), and with Anna's athletic strength and Carter's knowledge, they pool their abilities and work together on their survival strategy. "You're the one who knows all the stuff to get through the jungle. You're like a knowledge warrior," Anna said. Being prepared for emergencies usually requires having the right stuff--equipment and supplies-- but also the right stuff in the mind--knowledge and spirit, the theme of author Johnson's survival stories for middle readers. Johnson offers both advice in keeping cool and in her author's note the contents of the Canadian Red Cross Survival Kit, as well as a list of helpful websites for emergency preparedness. Close calls and courageous actions ensue and the two manage to save each other several times in this cliff-hanger survival story. Other books in this series are Overboard! (Survivor Diaries) and Avalanche! (Survivor Diaries) (see reviews here). The steps to the church. the number of dishes and spoons she washed in the bright white sink. The one thing she didn't count were the stars. Only a fool, she thought, would try to do that. Even so, the stars sparked her imagination. Always curious, even as a toddler Katherine Johnson took to math. As a Kindergartner her test scores were so high that she was allowed to skip three grades. She finished eighth grade at age ten. But back then America was legally segregated by race. Her town's high school wouldn't admit black students of any age. "Count on me," said her dad. Katherine's parents simply moved the family to another town where there was a high school for black students, and Katherine finished high school when she was fourteen. She graduated from college with a degree in mathematics when she was only 18, hoping to be a research mathematician, but the only job she could get at that time was as an elementary teacher. But in 1950 the U.S began research on space flight and began hiring people with mathematics degrees by the thousands. Katherine found a job as a "computer," the term at the time for people who did paper-and-pencil mathematical calculations with NACA, the predecessor of NASA, and at last Katherine Johnson was able to do theoretical mathematics in the area of space flight. When NASA began the Gemini Project, Katherine finally found the kind of work she had dreamed of when as a child she had marveled at the stars. Most of the "computers" were women. They were given tasks the men thought were boring. That didn't bother Katherine. Katherine had not lost her curiosity for advanced mathematics, and her skills gained her such acceptance that when NASA was preparing for the first manned flight orbiting Earth, astronaut John Glenn insisted that only Katherine Johnson could approve the mathematical calculations for his flight. And when an explosion on the Apollo spacecraft occurred on the dark side of moon and new calculations were required to get the astronauts and their craft back to earth, everyone agreed on the one person who could be trusted to do the number-crunching. It was the toughest challenge of her life. Katherine's calculations allowed the spacecraft's crew to make the maneuvers necessary to conserve their remaining fuel and make it safely back to earth. The success of the Apollo Project made a profound difference in the geo-political situation and gave impetus to all further space missions. 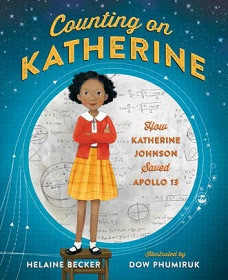 Helaine Becker's just-published picture book biography, Counting on Katherine: How Katherine Johnson Saved Apollo 13 (Henry Holt, 2018), packs plenty of suspense into the story of the little girl who grew up to make a huge difference in the success of America's early space program. As one of the female "computers" for NASA, Katherine Johnson and other black mathematicians were celebrated in the award-winning 2017 movie, "Hidden Figures." Artist Dow Phumiruk depicts Katherine Johnson beautifully as a quietly confident young woman whose infinite curiosity, hard work, and devotion to her passion for mathematics made a huge difference for her country at a pivotal time in history. "An excellent biography that will inspire young readers, especially girls, to do what they love," says Kirkus Reviews. A family of four is in a flurry and a scurry of a hurry. It's very early, but they are packing up the baby (where's his other shoe?) and the supplies for an all-day outing. Everything they'll need--except a picnic. And there's a reason for that! Time to hustle. There's prep to do. Bring in the groceries. Here comes the crew. Let's get moving.No time to rest. Everybody's going to the Food Truck Fest! At every big outdoor event, there are special things to do and view for all kinds of people of all ages. Stuff to see, stuff for sale, music to hear, games to play. And circling whatever the event has to offer, there are the trucks with a world of foods to proffer. But this time all the crowd needs to do is bring their appetite. This time the food trucks are up-front and center. This is a Food Truck Festival! Bright trucks of all sizes and hue, each one with its specialty, made just for you! The cooks dice and slice, frying and baking. What are all these food trucks making? One of them has got just what you're craving. 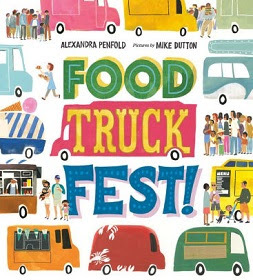 From hot dogs to frozen yogurt, it's a cacophony of cuisines in Alexandra Penfold's appetizing Food Truck Fest! (Farrar, Straus and Giroux, 2018), written in the author's snappy rhymes and rhythms, and illustrated temptingly by artist Mike Dutton, whose comic gouache illustrations feature a fantastic mix of people and appetite-whetting food trucks with the wonders of world-wide foods. There's something for everyone from the food truck folks in what Publishers Weekly says is "right on the mark for this down-to-earth, artisanal cuisine and its scrappy, hardworking purveyors." Caroline turned from the studio door and studied Rae's face. "Friends...... to the end," they finished the sentence together. After two tough weeks of slicing and dicing, they were the only ones left. Now it is the battle to see who would be the winner. It's time to cut the mustard! Caroline and Rae are the last cooks standing in the reality TV show "Next Best Junior Chef." They've beaten out the competition--Tate and Oliver--and now it's a week-long cook-off for the culinary crown--with the grand prize the winner's very own custom-crafted food truck. The theme of the finals is "innovation." Caroline and Rae think they are already creative cooks, but now the fat is really in the fire! But after the first day's competition, the producers throw a pickle into the porridge. They bring back the vanquished boys, Tate and Oliver, for a second-chance round! Rae's temperature rises to a boil, and Caroline is steamed. The two guys are talented, but... well, arrogant. Both of them think they're the big cheese, and they are not above trying to curry favor with the three top chefs. The girls vow to remain friends through the finals, but the two boys are all too ready to send each other to the bottom of the food chain. The girls are determined that both Tate and Oliver are going to have to eat crow. The competition is as stiff as an over-beaten meringue, as the junior chefs rise to their best efforts to be inventive. Rae mixes candied jalapenos in her deviled eggs, and Oliver uses mac and cheese instead of bread in his bruschetta. Caroline comes up with a chive-spiced potato-cake taco with creme fraiche, and Tate "dies at the pass" when his cranberry concoction fails to jell and his creativity caves. He's eliminated, and at last it's Ta ta, Tate! 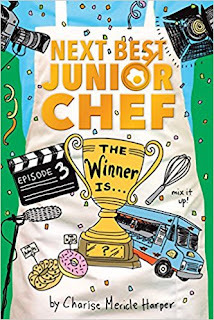 Now it's down to the terminal trio and the heat is truly on, in Cherise Mericle Harper's The Winner Is (Next Best Junior Chef) (Houghton Mifflin Harcourt, 2018.) The finale to her Next Best Junior Chef series is fresh, with plenty of gastronomic improvisation in the young chef's creations. Winning is never a piece of cake, but the girls remain friends and a good time is had by all in this latest fest for young chefs. This take-off on the reality chef TV competitions is, in a nutshell, the cream of the crop for competitive cooking comedy. A culinary battle with the boys, best friends to the end, and lots of foodie fun make for a satisfying summer read, and as in all her books, Harper's own drawings add zest to the savor of the story. The author of the mega-popular Just Grace series (see reviews here), Harper's earlier books in her culinary series are Lights, Camera, Cook! (Next Best Junior Chef) and The Heat Is On (Next Best Junior Chef). More than anything, I love being surrounded by water. Fully immersed in that relentless, translucent beautiful element, I feel... a sense of freedom, of not feeling limited or disabled.... That's why I took to swimming with such ease. All my life I have had to fight to catch up with people. But not in the water. That's the one place where everyone else is trying to keep up with me! Jessica's life didn't begin propitiously. A baby girl born without most of her lower legs, left by her unwed teen-aged mother in an orphanage in Siberia, her fortune changed when she was adopted by a couple from Baltimore who were told they could have no more children. It was a match made in heaven for Jessica and her family as well, and with some surgery to make her lower legs amenable to prosthetics, Jessica was soon toddling after her two older siblings and adopted brother Josh. But it was that dip in the local pool that set her on a path that led to the ParaOlympics and to many gold medals in swimming. Her athletic abilities and determination to excel won her a place at age 12 on the American team, three gold medals, and much self confidence, along with a closeness with other athletes with disabilities. Jessica Long also earned multiple medals in the 2004, 2008, 2012, and 2016 Olympics, becoming the second-most decorated American ParaOlympian. 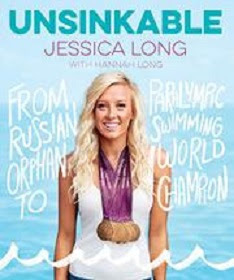 On the cover of her forthcoming memoir, Unsinkable: From Russian Orphan to Paralympic Swimming World Champion (Houghton Mifflin Harcourt, 2018), Jessica Tatiana Long looks like the quintessential "golden girl," beautiful and blessed by fortune. But Long writes with an intimate honesty of her long slog to success with a final gold medal at the Rio Olympics, her learning problems, her OCD and relentless stubbornness that once led her to spend two days making up her bed so perfectly that she couldn't bear to sleep in it for two years. "I've never been good at listening to people. They always seem to tell me what I can't do," she says, admitting candidly that that trait was often--but not always--a asset. Jessica's first person narrative of her life to age 25 is open, honest, and always inspiring, a memoir which offers young readers a glimpse into a young life that has been definitely extraordinary. Along with accounts of chilly 6 A.M practices, fun with friends missed, and an emotional reunion with her birth mother and several Russian siblings, there are also glitzy photo shoots and gossipy glimpses of celebrities, hairdos, glamorous gowns, and the red-carpet ESPY awards for readers to experience, as well as details about what it took to arrive at those high points in her life. Long's memoir, organized in a series of the momentous "moments," give middle and teen readers a window into a different world, written from a moment of retrospection by someone who knows it intimately. Mom's got an early morning surprise for little Fairy. "You'll be starting school soon, Fairy. You're probably wondering what to expect." Mom pours each of them some herbal tea from her acorn teapot and sits down to brief her little fairy on what to expect from her first day of school. "You'll put on your backpack and fly to school, either with your family or on the schoolbird." The schoolbird sounds a lot like Mother Goose, which promises to be a fun way to flit to school. 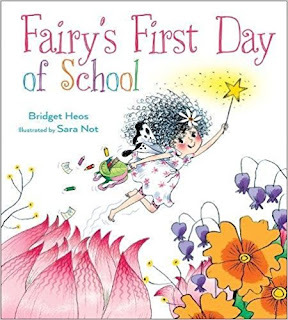 Little Fairy's mother tells her that a very kind teacher will greet her with a shower of fairy dust, have hang her backpack with the others on a dandelion leaf, and come along to meet the others in her class. "Flutter your wings to say hello," she says. Her teacher will sit the class down in a crisscross berry sauce circle and reminds them to raise their wands if they have a question. There will be center time for learning about magic spells and classifying collected baby teeth for the tooth fairy, and they will take turns being the door holder, the line leader, and the pet helper. At lunch, politely take a seat on your toadstool, Teacher will tell them. And after rest time in the napping tree, there is story time--with everyone's favorite fairy tales. "Once upon a time, I had my first day of school!" You see, I ate Kenneth's lollipop. It looked so tasty--and it didn't have anyone's name on it. How could Little Penguin know Kenneth had a claim on it! But Kenneth the Seagull is in a snit. He's marching with a banner... NEVER TAKE A LOLLIPOP FROM A SEAGULL! Who knew seagulls can pout over a lollipop forever? And Little Penguin needs help from her readers to get Kenneth out of his funk! Can everyone please make funny faces to wipe the glower off of Kenneth's glum face? Can they jump up and down and act extremely goofy to make him laugh? 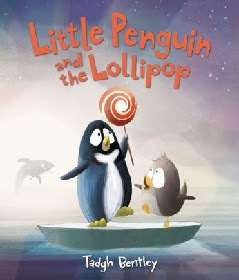 Young readers will probably be glad to help Little Penguin out with that, in Tadgh Bentley's Little Penguin and the Lollipop (Balzer and Bray, 2017). After all, it's no fun being stuck on an ice floe with a cranky seagull. Bentley's comic illustrations have great giggle appeal, and fans of his interactive picture book, Little Penguin Gets the Hiccups, (see review here) will be glad to pitch in to help end this seaside stalemate. Friends at school--there's nothing better. Llama learns all the letters! No two letters are the same. But every letter has a name. Llama Llama proudly says the alphabet. He can recognize each letter. But Teacher says that not ALL. Letters together make a word! Some words are short and easy. B + E makes "BE." Llama Llama gets it! He can read! But wait! Some words are long, and the letters don't follow the rule. What the use of all this school? Llama's hooves wave in the air. Some words are hard. It isn't fair! But Llama's teacher points out that he has to be patient. Sound out the letters slowly and listen for what you hear, she says. What word makes sense in the sentence? Try to remember it; you'll see it again. And soon that word will be an old friend. Llama Llama and his old friends Nellie Gnu and Billy Goat work hard together all the way through the lesson. Soon there are more words they can read. Way to G + O, guys! Words make rhythm. Words make rhyme. Words make books for story time. And Llama Llama can't wait to get home to read for Mama Llama, in Reed Duncan's Llama Llama Loves to Read (Viking Books, 2018). He's definitely on his way. Working with the late Anna Dewdney's ideas for this book, Duncan captures much of the appeal of Dewdney's clever couplets, and illustrator JT Morrow reproduces the warm style of Dewdney's loving lines and coloration in a story in which youngsters will rejoice with Llama Llama as he himself becomes a reader! Daddy and Uncle bring chairs from the shade. It's the lazy, hazy days of summer for the grownups. But the summer colors of the flowers and fields run riot, and so do the vacationing kids. It's summer and they mean to make the most of it. Even a threatening cloudburst doesn't inhibit the joy of the two kids who own the landscape. Summer's lease has too short a stay, and they don't need Shakespeare to tell them that. 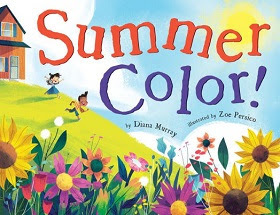 In Diana Murray's joyful Summer Color! (Little, Brown and Company, 2018), the kids hit the ground running and see it all--grazing deer, egrets taking flight, frogs hopping into the creek, and a water snake slithering silently through the water. Then the sky darkens and down come the showers, leaving behind a rising mist--and a rainbow to spot as they race to shelter on the porch. There are no delicate watercolor scenes here. Artist Zoe Persico's landscapes pop with supersaturated hues. The deep greens of the trees and the bright, bright colors of the flowers fill the pages with the showy shades of high summer. And a good time is had by all. "A chipper frolic through nature's colorful palette," says Kirkus Reviews. Life in the zoo was glorious for Leopold. Every day kids laughed and cheered, and the snacks... were delicious. The morning began with the usual squeals of admiration. "Oh, boy! Oh, boy! The TALLEST ANIMAL IN THE WORLD!" Leopold RULES the ZOO. He's the tops--literally. But one day as he is greeting his loyal public, he gets a shock. at the gleaming smile bobbing beside him. It's a gigantic giraffe-head balloon, held by a grinning boy. And Leopold's erstwhile fans are fickle! For some reason, the kids are quite taken with the thing! They go ga-ga over the balloon, as the kid holding the string makes it bob and duck and do loop-the-loops. He brags that it smells fresh and doesn't have to have to be fed giraffe treats. Leopold gives himself a sniff. Who says he's not fresh? He twists himself like a pretzel, looking between his legs at his tail. Who says he can't do tricks? "I zoom! I bounce!" Leopold boasts. But all eyes are still on the balloon. Leopold finds himself a bit winded, while the balloon zebra's fat face still has that phony smile. They're eyeball to eyeball, and Leopold has just blinked. He stalks off to sulk under his favorite tree. How can his former fans desert him? His rival is an airhead, full of hot air. He's a grinning, gassy, goofus! As Leopold ponders the fickle finger of fame, he spots something with... possibilities. His acacia tree has... THORNS! Hmmmm! But Leopold's glee turns glum when he sees the crestfallen face of the kid holding the now deflated balloon. Awwwww! Now all the kids are sad. Leopold feels terrible. What can he do? Is this a picture book or what? 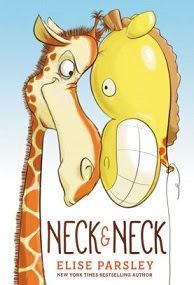 There's a surprise ending in store (and lots of laughs and a little lesson in humility all around) in Elise Parsley's latest, Neck and Neck (Little, Brown, 2018). Author-illustrator Parsley, creator of the top-selling If You Ever Want to Bring an Alligator to School, Don't! (Magnolia Says DON'T!) and sequels, (see reviews here), is back in fine fettle in this new one. Her premise is as preposterous and her illustrations as wild and woolly as ever, and her story is perfectly paced to keep the pages turning in this nose-to-nose, neck-to-neck, eyeball-to-eyeball face-off that is fantastically full of top-of-the-heap fun. THIS IS MY TEACHER'S IDEA JAR. MY TEACHER SAYS SAYS STORIES CAN BE ABOUT ANYTHING WE WANT. Not surprisingly, this elementary school class has some classic story starters in that jar--a dragon, a Viking, a unicorn, a robot, a tiger--all the usual suspects. But these potential story characters are getting a bit restive in that crowded jar. The giraffe and dragon poke their heads out to catch a breath of fresh air. There's a fine variety of of characters there, from cat to cowgirl, and they all want their own story. What to do? Teacher points out that the kids can choose their medium. WRITE IT. DRAW IT. TALK IT. COMBINE IDEAS TO MAKE YOU STORY BETTER. As authors will tell you, some characters take over their own story. The Viking tips the jar over and lets everyone out. The horseless cowgirl mounts the dragon and takes on the Viking and the space robot. Who wants to create a city for the kitty? Anybody ready for a yeti yet? 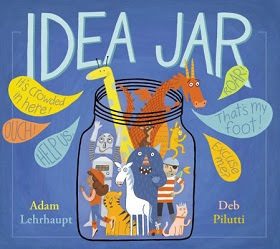 It's a free-for-all as the kids get busy drawing and writing and talking about their ideas, in Adam Lehrhaupt's Idea Jar (Simon and Schuster, 2018). Author Adam Lehrhaupt puts his jar of "writing prompts" to work in this story about stories, while artist Deb Pilutti comes up with a charming coloration and a plot full of story starters running amok, as the Viking's ocean even threatens to overflow the classroom. Pilutti make use of comic speech balloons as her charges take charge of their own premises in a fun read-aloud to kick off a class brainstorm to get the creative juices flowing in young writers' fertile imaginations. Share this one with Briane Farley's Ike's Incredible Ink (review here) or Joan Holub's Little Red Writing (see review here.). Whit took a deep breath and tilted his head forward so that our foreheads touched. I took in his blue eyes and thick red hair, the genetic combination that made him such an unusual Punnett square. Except for the last year's death of her mother, Maya's life has been going as planned. She's got a scholarship in chemistry at MIT, a private room in her chosen dorm reserved, an internship at the lab where her Mom had worked, friends Bryan, Kyle, and Yael to hang out with, and the perfect boyfriend--Whit. Except that now, she apparently doesn't have Whit. Maya is blindsided by Whit's dumping her for another girl, someone she even knows, one who's in her friend Bryan's Shakespeare Company in rehearsal for "All's Well That Ends Well." She'd thought she'd be with Whit forever. She can't imagine a future without him. And then her mom's sister mentions the private research her mother was working on before she died. "You should have had your mother around for your first breakup," said Cindy. "I'm not sure Mom would really have understood," I told Cindy. "Dad was her first love. She never had a first big breakup." Cindy leaned forward. "This is what your mom was doing before she died, right? Trying to make love last?" Maya finds the private notebook her mom had insisted was to come to her. Inside are her mom's records on research on the effect of pheromones on different genotypes. It seems her mother had been taking intensified pheromones tailored to her father's DNA and measuring his reactions. They were clearly positive. It seems to Maya that her mother had been on the way to creating a successful formula--a "Love Potion No.9." . Maya meets privately with Ann, her mother's graduate lab assistance, and offers herself as a subject to continue the research. Ann is intrigued with the possibility for original research leading to a dissertation and insists on setting up the experiment with three trials, one with a platonic male friend, one with a stranger, and then--Maya's real reason--the last trial on Whit to see if her customized pheromones will win him back. Maya manages to collect a specimen for her first trial--a soft drink cup used by her childhood buddy Kyle. Ann processes his DNA and prepares custom-crafted doses of pheromones for Maya to take for three days. Her temperature goes up a degree, just as her mother's observations predicted, and when she invites Kyle to come over to watch a movie, things between the two old friends get surprisingly heated, so much so that they are both astounded and embarrassed. A second trial with conceited teen-aged YouTube star, Asher Forman, starring with Bryan in "All's Well That Ends Well," gets quite a response. Maya is not at all turned on, but Asher definitely is. Maya is a bit shaken by the strength of the reactions she is getting. But isn't that what she wanted? And now it's time for a trial of her intensified pheromones on Whit. In a what turns out to be a very Shakespearean plot, there is a perfect storyline twist of which even the Bard himself would have approved. 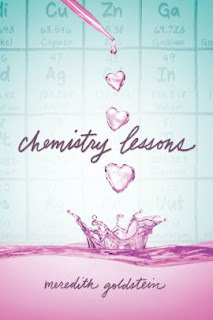 All's well that ends well, indeed, in Meredith Goldstein's forthcoming Chemistry Lessons (Houghton Mifflin Harcourt, 2018), a young adult novel which is both a light teen romance with a spritz of science and a bit of a coming-of-age story in which Maya comes to terms with her mother's death, her father's grief, and her own new understanding of the importance of the interplay between friendship and romance, perhaps the essence of real love. Despite bouts of teen angst over being dumped, Maya is a smart, resilient, and upbeat seventeen year old who, refusing to languish over lost love, instead turns to her long suit, science, to get her guy back, learning along the way the truth of the Rolling Stones' old song lyric: "You can't always get what you want...but if you try sometime... you get what you need." Goldstein's romance novel is well scripted, with touches of tragedy and comedy, charmingly awash in the scholarly scenes and scents of its setting in Cambridge, Massachusetts, and with an intriguing bit of science to move the plot. Maya may get her guy, but perhaps not the one she expects, because, although pheromones do play a role in attraction, happily the secrets of lasting love remain a mystery. And as that other old song says, "That's the story of, that's the glory of... love!" When a determinedly cheerful mom drops her son off after school at the doorstep of a small house, the boy clearly is not happy. He trudges dutifully up to the door, his backpack heavy on his shoulders and his eyes downcast, and rings the bell. He's met by an old man, his grandfather, but there are no greetings exchanged. The grandfather bows, his hands together in salutation, and the boy returns the gesture glumly. They seem to know no words in common. The grandfather turns on the television, but the boy gets little out of the drama, aside from the presence of a dragon in the story. Bored, the boy pulls some colored pencils and paper out of his backpack and begins to draw a spirited young wizard with a wand and powers to vanquish a dragon. The grandfather suddenly smiles and leaves the room, returning with a sketch book, a tiny brush, and an inkwell. Taking a seat beside the boy he draws a marvelous ancient Asian sorcerer who dispatches the dragon with a broadsword. The boy's eyes are alight as he draws his wizard by the side of his grandfather's sorcerer. Together they create a magnificent magical story. Art is the medium which bridges the gap of age and language between the two as each realize what they share together, in Min Le's wordless Drawn Together (Hyperion, 2018). Inside the unspoken narrative, artist Dan Santat works his visual magic in illustrations that show the two relatives doing their favorite thing together, as both realize that they do indeed share the bond of kinship and a love of art. 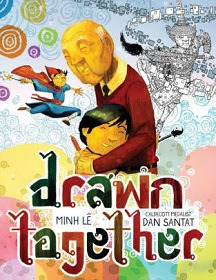 It is a beautiful story of family love and generational connection, with artist Santat making the most of the opportunity to show off his versatile talents in two different styles, in a book that can be "read" by all ages. A beautiful book that speaks volumes about the ties that bind grandfathers and grandsons. Says Publishers Weekly "Santat's work dazzles with layers of color, exquisitely worked tradional designs, and ambitious scale. With the grandfather drawing in his idom and the boy in his, the two defeat the dragon of difference that separates them." Splat's eyes opened and his mouth fell open when his mother told him the news. "Soon, Splat, there's going to be a new baby in the house." What? Splat is flummoxed. He's always thought it would be fun to be a big brother. But this is so sudden! Splat knows that there is going to be a lot to do, so he pitches in. He and Dad do up the spare room as a nursery with cutesy wallpaper and a mobile and bring up Splat's old crib from the basement. The two congratulate each other on their work. But before Splat can ask any questions, Mom appears at the front door with a baby in a carrier. CROCODILE! "How did this happen? He'll eat us up!" Splat zips back up the stairs and hides under his bed. But Mom and Dad assure Splat that little Urgle doesn't eat cats, and that he'll only be there a few days while his mother is away on a trip. And anyway, this will be Splat's chance to try out some big brother skills. And once Splat gets the hang of it, he's soon helping out with Urgle's bath and lunch, and (GULP!) assisting with a diaper change--for which Splat dons his handy yellow hazmat suit. Soon he's in the swing of things, having fun with little Urgle. "One day soon... very soon!" 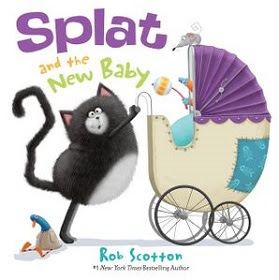 There's a hint of big changes ahead in Rob Scotton's newest picture book, Splat the Cat: Splat and the New Baby (Harper, 2018). In this happy and heartwarming family life story, Scotton's always nervous preschooler gets a little preview of coming attractions in this long-running and successful series. As always, Splat's facial expressions and nervous tail telegram his anxiety as he encounters a new situation, while his parents help him succeed and gain competence and confidence in his new setting, and Scotton's charming illustrations tell the story well, with both humor and good will. HI! MY NAME IS EARTH. SOME PEOPLE CALL ME GAIA, THE WORLD, THE THIRD PLANET FROM THE SUN, THE BLUE MARBLE. YOU CAN CALL ME MR. AWESOME. The Earth is not even the biggest among his siblings, the eight various planets (and their family pet, Pluto), but Mr. Awesome has a unique and fascinating history. 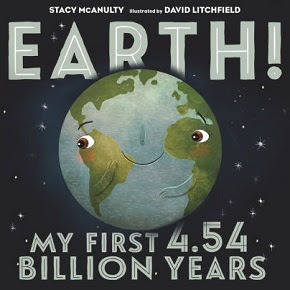 And that history is the awesome story told in Stacy McNulty's Earth! My First 4.54 Billion Years (Our Universe) (Henry Holt, 2017). There is a lot of history to cover in 4.54 billion years, and author McNulty begins with Mr. Awesome's movements. Earth was born to move, so to speak, and he or she spins and revolves in the daily and annual cycles which have some major effects upon its surface. But the big story is Earth's personal history. I WAS BORN 4.54 BILLION YEARS AGO. I DON'T REMEMBER, BUT I HAVE BEEN TOLD I WAS A HOT MESS! EXPLOSIVE! GASSY! CRANKY! THEN I GOT COOL. REALLY WET! FOR THOUSANDS OF YEARS. I'M NOT KIDDING. THOUSANDS! I WAS LONELY! MY ISLANDS MUST HAVE BEEN LONELY TOO. THEY GOT TOGETHER AND MADE CONTINENTS. Author Stacy McAnulty takes elementary readers through Earth's past in a breezy conversational style, made understandable in the jolly anthropomorphic illustrations of award-winning artist David Litchfield, as plant and animal life develops--hitting the high points of earth history, including dinosaurs, asteroid collisions, major volcanic events, ice ages, extinctions, and the emergence of homo sapiens. There are plenty of curriculum connections and a solid appendix with bibliography and sources to prepare middle readers for scholarly research reports along the way. With a suitably thorough account of the major elements of earth's geological and biological history in an easy reading style, this should be a first choice for school and public libraries. "Terrifically entertaining," as Publishers Weekly puts it in their starred review. Pete the Kitty jumps out of bed. Grumpy Toad and I have a groovy playdate! Grumpy Toad's idea of a playdate is letting Pete watch him pushing his new blue truck around his room. Pete is not pleased. But he politely turns to building roads for the truck with Grumpy Toad's blocks. But Grumpy claims the blocks are his and only his, too. Pete tries to be flexible, but Toad grabs every toy that Pete touches and sits sulkily in the corner guarding his stuff. This is not Pete's idea of a groovy playdate. Pete is sad. Pete is blue. But Pete thinks he knows what to do. 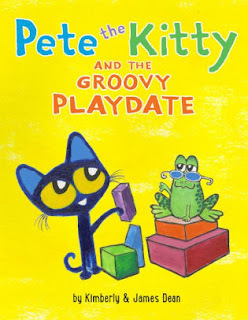 He has to persuade Grumpy Toad that one alone is not the way but two together can share to play, with Kimberly and James Dean's hints at how to save the play date in Pete the Kitty and the Groovy Playdate (Pete the Cat) (Harper, 2018), and soon the Caped Critters--Wonder Toad and Super Kitty--soar together to save the day. James Dean's cute kitty is always upbeat as he shows his friend how they can share the toys and have twice the fun. It's hard for young preschoolers to let go and let their friends have a chance to play with their toys, and Kimberly Dean's story shows how the visiting friend feels when he's told he can't touch his friend's toys and how working out ways so that both can play makes for a very groovy playdate. 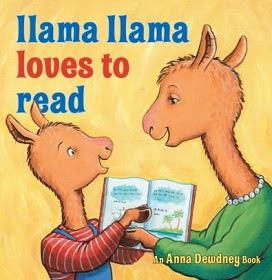 Definitely share this one with Anna Dewdney's delightful and insightful Llama Llama Time to Share. MAYBE YOU CAN LEND A HAND! It's an invitation you can't turn down! But what does it take to make that sound? It takes melody, harmony, and rhythm. First, to move your feet, you've got to have that rhythmic beat: There's a snare drum, with two drum sticks, one for each hand. And to back it up, shake-shake-shake those two maracas! There's the trombone, with his long slide. He can play fast and hot and slow and sweet! And don't forget the piano and guitar! They can do it all--melody, harmony, and rhythm! At the same time! STRUM, STRUM! STRUM WITH YOUR THUMB! 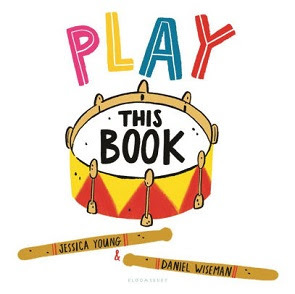 Kids are part of the show in Jessica Young's interactive introduction to musical instruments, Play This Book (Bloomsbury, 2018). Young's simple narrative builds a band, with kids busking along on every page. Daniel Wiseman's bright and busy illustrations back up this simple intro to some of the instruments that make music and kids will want to join in and take a bow as the author invites them to do at the end of the performance. Says School Library Journal, "Music-loving kids will go nuts for this interactive book. . . ."
For more interactive book fun, share this one with Young's earlier book, Pet This Book.